Click on the Opera button > Settings. 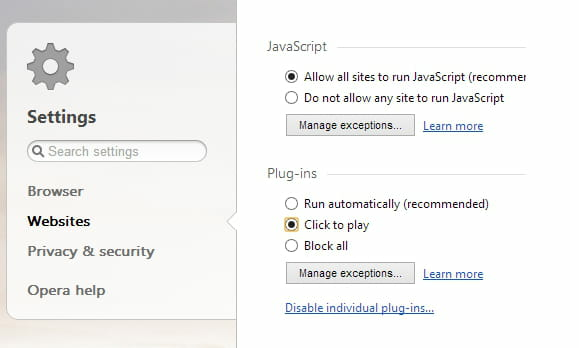 In the right pane, scroll to the "Plug-ins" section and select "Click to play". Published by jak58. Latest update on December 8, 2013 at 02:42 AM by jak58. 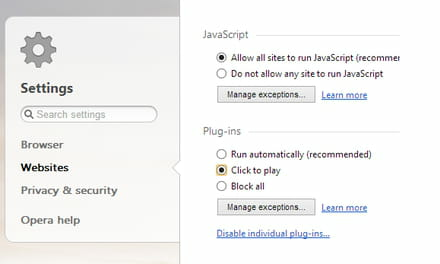 This document, titled "Opera - Enable the plugins click-to-play mode," is available under the Creative Commons license. Any copy, reuse, or modification of the content should be sufficiently credited to CCM (https://ccm.net/).